Log into your Bittrex account and find your way to your account settings page. On the left-hand side of the settings page, find and click the ‘IP Whitelist’ tab. This will take you to this page. 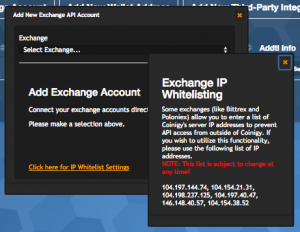 You’ll need to copy and paste these IPs into the Bittrex IP whitelisting page and then confirm your attached 2FA code for each IP that you add. Note: our IP addresses are subject to change at any time, though we will give our best effort to let our users know. Don’t hesitate to let us or Bittrex know if you need any assistance in adding IPs to your whitelist!